Can carrots really make you orange? It’s a common belief that eating enough carrots will turn you into one, at least in terms of color. Well, as it turns out, this urban myth actually has a lot of truth to it. Carrots contain what’s called “beta-carotene”, which according to uamshealth.com who cites their Dermatology Clinic, does in fact cause the skin to change colors to a more yellowish tone, which can be perceived as “turning orange” to some people. As you can see in the photo, no, you don’t actually become a carrot. 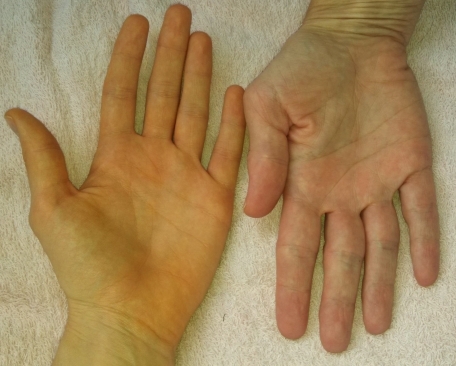 However, the condition shown in the photo above on the left, known as carotenemia (also known as “carotenosis”), is what results from consuming too much carotene. Similar effects on the body include jaundice, though unlike jaundice, the whites of the eyes do not take to the discoloration. In fact, with carotenemia, the clearest effects take place in the palms and soles, and generally effects younger children more than adults. The effects of beta-carotene is based on the consumer’s level of metabolism. Not everyone becomes “orange” in the same dosage of carrots. Thankfully, this condition usually doesn’t cause other health problems or diseases, and carrots, being a great source of vitamin A, and can also benefit eyesight (Jill B Koury, MD). So yes, carrots can in fact convert you into an rather orange-looking human, however, you really don’t need to worry about it happening to you too easily. But hey, you are what you eat! This entry was posted in Uncategorized on September 9, 2016 by Brian Cunningham. What I am now curious about is how many carrots do you have to eat in order for this to happen? And for how long? I would think at least one large bag of carrots in a day would do the trick. But I also feel like you would have to do it for a long period of time, and be missing some other part of your diet. Besides, couldn’t you develop a carrot tolerance? I guess this phenomenon occurs because beta-carotene affects skin pigmentation. So does that mean there are other substances which can alter your skin tone? I loved this post because growing up my mom always told me “you’re going to turn orange if you keep eating carrots,” No joke- I was like a rabbit. I knew there were health benefits to helping improve your eyesight and I think that’s why I made myself eat so many- I wore glasses starting in 5th grade and I thought that I would never have to wear them ever again if I ate a lot…I am not kidding. It is very true that “you are what you eat,” because my skin did eventually change temporarily to an orange tint when I was younger. I never knew the reason why carrots make people orange, but now I know. I never heard that carrots can tint your skin orange…only that they improve your eyesight. Is there any validity to that statement I wonder? However, your statement seems valid given the evidence used to back it up. As I read, I thought whether people who actually eat a lot of carrots notice this change in pigment. So beta – carotene is good for you because of its nutrients of vitamin A? I am actually allergic to carrots, so looks like I won’t be turning orange anytime soon! I only know that carrot is a good choice for having Vitamin A and it can help us to avoid night blindness. “Drinking much milk can make you become white!” one of my friend in my high school told me, and she has kept drinking milk everyday in order to achieve that. I don’t know whether it is true. But after reading your post, I am really interested in it. And carrots can make me orange really make me surprised. So when we eat food, we should pay attention to its components and its effects. I found this post to be highly entertaining. Who knew, the phrase “you are what you eat” could be so hauntingly realistic? I never knew that high does of carotene could change your skin color, even in the slightest way! This definitely makes me much more aware of what I eat and the ingredients inside such praised vegetables and fruits. Hmm…I wonder why carotene affects younger children more than it does adults. Perhaps their growing bodies are more susceptible to specific ingredients in food. Heck, if carrots can make you orange who says plums can’t make you purple?